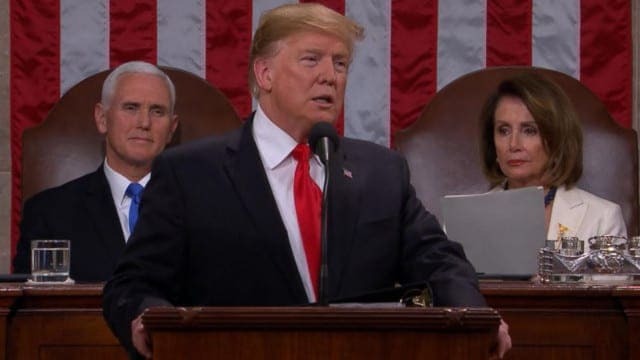 For visuals, the Democrats sat on their hands and sulked.“America never has been and never will be a “socialist country!” Yeah, “USA, USA, USA.” President Trump’s speech revealed a lot of truths to the eye of the beholder. His remarks were what MOST Americans wanted to hear because for two years, the president has kept his word, or has tried to while the Democrats have only worked to obstruct him, not because of policy differences, but because it was Trump. He specifically referred to Dachau, the Nazi’x first concentration camp near Munich which was liberated by American soldiers. The two holocaust survivors had to have been little boys when they were liberated and, at least, one had to have been a Jew. This was the Presidents forceful statement against the growing semitism in the United States abetted by the Socialists in the Democrat Party who fail to rail against it, favoring instead that Americans should accept Islam as a religion of peace. Those exact words weren’t used but the meaning was clear. Of the most pressing issues facing America, how to stem the hoard of peasant invaders clambering at our southern borders to get in, Trump said the “wall will be built” but stopped short of declaring a national emergency. Why? because the disappointed Democrats were ready with instant lawsuits in the 9th District, to call a halt to any such national emergency. The president faces an option here as well. He could simply defund the 9th District Courts and let ‘em work on that while the wall is being built. Foreign policy and wars were not neglected either. A government of business, must have wars to sustain its productivity. Trump’s career was erecting buildings not blowing them down and he spoke to loss of treasure fighting such wars in the middle-east for two decades, that should come to an end. The political problems of a failed Socialist government in Venezuela, manifested by the mass exodus of citizens into neighboring countries, was also not ignored but a cautious approach helping its own citizens to overthrow the dictator Maduro, was implied. 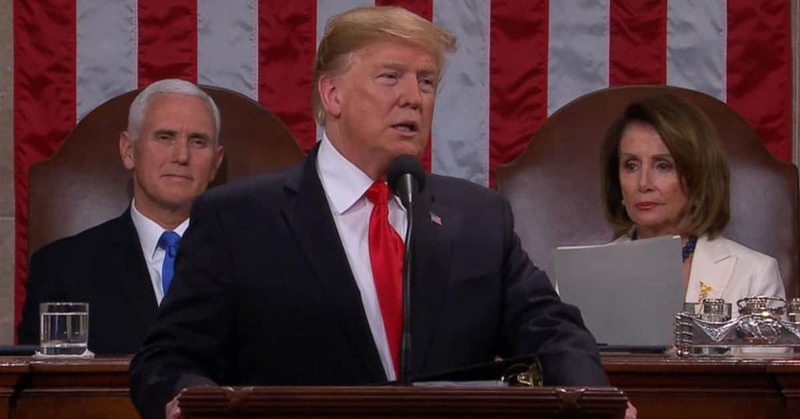 During his speech his constant theme was “Choosing Greatness.” Trump raised five areas on which both Democrats and Republicans campaigned and should therefore find agreement, among which were jobs and fair trade, rebuilding the nation’s infrastructure, reducing the costs of healthcare and prescription drugs, creating a legal immigration system and pursuing a foreign policy agenda that “puts America’s interests first.” It was a successful Donald Trump pushing the Make America Great Again agenda.